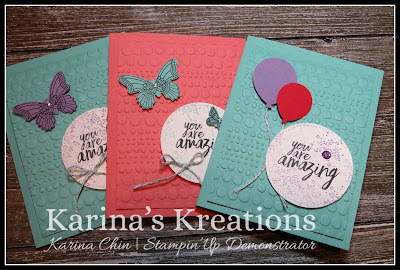 Karina's Kreations: Stampin'Up Butterfly Gala Sneak Peek! Stampin'Up Butterfly Gala Sneak Peek! I have some fun cards to share with you. My group meeting is tonight and I'm calling it my Onstage After Party! I have the best group and I wanted to spoil them so I'm throwing a party! They get to see new items from the upcoming catalog, as well as the goodies we received from Onstage in Orlando. To be part of my Krafting Crew group all you need is to purchase a starter kit. I also like to recognize sales/purchases and I made these cards for my friends with higher sales. This card is made using the All Things Thanks stamp set and the Stitched Shapes Framelit Dies. The sneak peek item is the new Dot to Dot textured impressions embossing folder. I love the fun playful dots which is perfect for all kinds of card. I also used the Balloon Bouquet Punch and Glitter enamel Dots. The next card uses the new Butterfly Gala stamp set and coordinating Butterfly Duet Punch. Dec 5 you can pre-order these products or purchase them on Jan 3. Here's the supply list for my first card.